+1 for running a Cute Hound Commander! 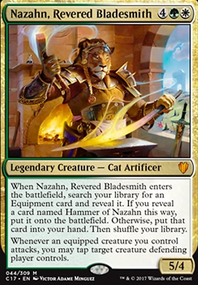 Hammer of Nazahn - Free equip for your equipments when they ETB and grants your Commander Indestructible. Highly recommended! Steelshaper's Gift , Enlightened Tutor , Taj-Nar Swordsmith - Tutors for your key equipments. Stoneforge Mystic - A staple for equipment themed decks. Nuff said. Leonin Shikari - Makes equipping at instant speed opens you to a lot of combat tricks. Or equip Lightning Greaves on your creatures in response to a targeted removal. Auriok Steelshaper - Reducing equip cost is always good. 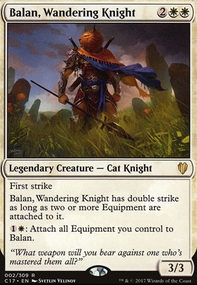 Balan, The Wandering Knight - Just in case you need a Plan B. The deck is quite mana intensive with all the equipping cost we've to pay so I'd recommend as much ramp as you can get. Extraplanar Lens , Gauntlet of Power , Caged Sun - Perfect for mono color decks. Mana Crypt - Up your tempo by a lot. Smothering Tithe - New toy that RNA gave us, you'll be swimming in treasures very soon. Ok, as promised I arrived home and I'm going to help you out, I'll redo the suggestions I did on reddit and complete with the rest. I would add Liliana of the Dark Realms to tutor some swamps, altho you already have several things to fetch lands, so it is up to you if you feel the need for it. Hatred is a card I recommend 100%, it's great as a finisher, and if your commander already has lifelink even better. If you can afford a Urborg, Tomb of Yawgmoth then Nightmare Lash and Lashwrithe are good additions aswell. Weathered Wayfarer, Herald of Leshrac, Leonin Shikari, Oreskos Explorer, Taj-Nar Swordsmith, Divine Reckoning, Bloodforged Battle-Axe, Grappling Hook and/or Fireshrieker, Felidar Umbra, Hammer of Nazahn, Infiltration Lens, Kusari-Gama, Thaumatic Compass Flip, Myriad Landscape, Shizo, Death's Storehouse, Phyrexian Arena, Vona's Hunger, Crucible of Worlds. Torment of Hailfire and Exsanguinate are always good finishers in a black deck, and since you will be tutoring lands a lot you can guarantee a good value for X. Also if your playgroup plays a lot with graveyard consider Bojuka Bog. I think with the colors you have and playing Voltron you should add some pillowfort stuff to the deck, like: Ghostly Prison, Propaganda, Collective Restraint, Teysa, Envoy of Ghosts, No Mercy, Dread, Baird, Steward of Argive, Windborn Muse, Michiko Konda, Truth Seeker, maybe Darien, King of Kjeldor could work too. From what you already have on the deck I would remove the following cards: Darksteel Ingot and Fellwar Stone are not necesary, I know both of these are fixing but you already have several lands with 2 colors and plenty of land fetching, you don't need these. Helm of the Host is great, I love this equipment but in this specific deck I am not sure if it is worth it. At least not for the commander imo, but to use it on the other creatures you have that offer utility, specially the ones with ETB or the "propaganda" creatures, then it is definitly worth to keep in the deck. Lightning Greaves is loved by so many people but I don't really like it much, I mean the 0 equip is great, plus the haste but I don't like shroud, yes it protects your crature but also screws you, while it is equipped you can't equip other stuff on the same creature or enchant it, etc... So if you have no other creature to swap it and allow you to target your commander again you are basicly screwed, I don't think it is worth to occupy a slot with it. Same goes for Whispersilk Cloak, blue already gives you unblockable if you want, not worth to have this with the downside of shroud, I'd rather replace it with Aqueous Form for example. Mask of Avacyn is nice to protect your commander but that's all it gives, if you need a slot for something this is a card I would remove. Vedalken Orrery... You don't need this, I know the ability is nice and quite tempting but in a voltron deck you don't really need this, I would only keep it if there was a free slot with nothing better to put in it, but even then I think I'd rather add some equipment or aura instead of this. Baleful Strix is nice but for 1 more mana I'd rather have Phyrexian Arena in play, much better. Dreamscape Artist is nice if you can play lands from the graveyard, with Crucible of Worlds and similar cards, which btw is a nice recommendation for the deck, Crucible of Worlds would help you get your lands back when facing land destroyers or milling decks. Also not sure about Emeria Shepherd, I mean you can deffinitly trigger her several times, but idk. I would test the deck with her and see how she does, if she doesn't seem to be useful most of the times I would replace her, for example for the same CMC I would prefer Herald of Leshrac, much more synergy with your commander. Jhoira's Familiar is nice too, but again it is also one I would remove IF a slot is needed for something else. I'm also not sure about Walking Atlas, I think most of the times it will be a dead card on the board because you won't have land cards in hand at some point, making him generally a wasted spot on the deck. Yes he can be great in some situations, but when putting cards in a deck you gotta try and put the cards that will be good in any stage of the game, not only sometimes, and this guy is one of those "sometimes" cards. I also think you don't need Disallow and Stoic Rebuttal. I mean as someone who likes to play blue, I know how good and safe it feels to have some counterspells but in this specific deck you don't need that many, I would even say none but since you are playing blue anyway, 1 or 2 could be helpful but no more than that, remember the goal of the deck is commander damage, you already have a lot of protection for your commander in equipments and/or auras, you don't really need counterspells to protect him, so if you need slots for other cards I would even say remove all counterspells. I'm not a fan of Detention Sphere in commander, yes if your opponents have the same card in play it is great, but most of the times it won't happen, again it is one of those cards that are good sometimes but not always so I'd take it out. Regarding your lands I don't like much of Submerged Boneyard and Forsaken Sanctuary, Sunken Hollow and Caves of Koilos would be 2 good replacements that are not very expensive. I would also remove Temple of the False God and put instead some basic land, I mean yeah that 1 extra mana is nice and can help you but I'd rather have 1 more basic land to fetch with the artifacts, etc. To sum it up, I think this deck works best as a mainly W/B deck with a splash of blue, for some of the Propaganda effects it provides plus the evasion and card draw/selection. Other than that what you want for Voltron and to fetch lands you will find it on white, black and colorless. One small note, I think you have way too many things to fetch basic lands, maybe you could cut down 1 or 2, not sure. That's one of those things that require some playtesting, never played with so many so I am not sure how good or bad it can be. That's all I guess. I bet there are some more good things for this deck but I don't know it all, yet! I know some of my suggestions are not budget but you can just add them to the aquireboard section, for one day later if you decided to include them. Helping you out with this deck hyped me to try and make one with Korlash, Heir to Blackblade, as a nod to your own deck. If you ever need anything don't hesitate to contact me here or on reddit. Leonin Shikari is quite good, the "Instant" speed equip means you can move your Infect Grafted Exoskeleton, or Protection Hammer of Nazahn, or Trample Loxodon Warhammer, or Card Advantage Bloodforged Battle-Axe around after blockers are declared to maximize / have favorable outcomes. Along with a Puresteel Paladin he becomes great. To get his Metalcraft working properly you need some other artifacts like Ancient Den, Tree of Tales, Inkmoth Nexus. Since you have Bloodforged Battle-Axe in your build, I would try and work him in, because the Draw ability he offers when you start multiplying the Bloodforged Battle-Axe could be a win-con. Behemoth Sledge is good, I prefer the offense of the Loxodon Warhammer, the reason I don't run both is redundancy, since I tutor my artifacts, I would rather have more options than duplication/redundancy. However, in a less (equipment) tutor intense build, I like the redundancy as it increases my draw %. Coupled together with the Puresteel Paladin can get it's Equip cost down as well. You have Enlightened Tutor, but with no (creature) tutorable Stonehewer Giant or Stoneforge Mystic, I would run the redundancy since the Trample and Lifelink are both key to your success with Infect. 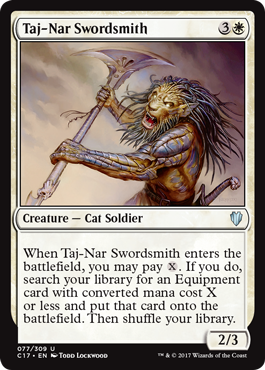 Taj-Nar Swordsmith is also not a terrible Equipment tutor in a budget scenario. I don't like his CMC but, he is a (Creature) tutorable, and gives an (Equipment) tutor for the Infect Grafted Exoskeleton. Depends how your finding your games going if he is relevant. If others are combo'ing on Turn3-Turn5 he wont have any impact. Skullclamp is a nice way to avoid creature removal heavy decks, like , can turn your 1 creature that has been Go for the Throat into Card Advantage. 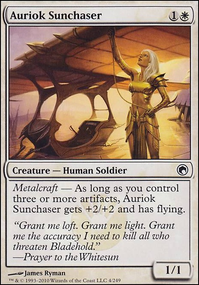 It also allows you to turn tokens into Card Advantage, and it's a CMC1 Artifact for Puresteel Paladin Metalcraft and Draw. 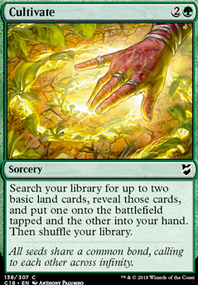 If you don't have a budgetary restriction on decks, Lands is definitely where you'll get consistency, things like Temple Garden are pricey, but very good because they are searchable as Forest and Plains and enable other lands like Sunpetal Grove as an example. Lifecrafter's Bestiary is also a decent budget Selesnya () card. I don't like its CMC3 cost, and it requires to activate, plus this isn't a creature deck. The Scry 1 combined with the Draw, can be effective though. Sigarda's Aid is another low CMC1 solution, but I would recommend Puresteel Paladin instead, he has far more utility. Kodama's Reach is also a good budget ramp tutor, it's another Cultivate. Perfect in draws where you get the Sol Ring. I use Chord of Calling for my Felidar Sovereign and Archangel of Thune/Spike Feeder combo. It's fairly pricey, but if you have it already, I would run it! 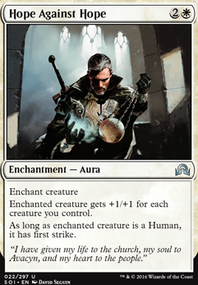 You can still use it to pull any other creature, like Lost Leonin too, but usually later in the game they are less effective, than the early tutor/double-strike like Worldly Tutor. Krosan Vorine is in your mainboard, my mistake. Take him off your Maybeboard. Fortified Village is still fairly inexpensive, I believe. Good for consistency. Path to Exile is a little pricey, but it doubles as an Emergency tutor, and it's Exile so VERY powerful. Rhonas the Indomitable I've found is an awesome tempo guy, ANY cat means that he can Attack, and is indestructible, and is Deathtouch, and can add Trample (or multi-pump an Infect/Trample Cat to win). Sylvan Library is ridiculously expensive, however, If you aren't under budget constraints, and you can trade for one, it's the BEST card advantage you have in the arsenal. I'm not a huge fan of Divine Reckoning, it's not going to get rid of the creature that is the REAL problem. It's only Destroy as well. I think, the creature that anyone else keeps is usually better than the creature you keep, except perhaps in an early Lost Leonin or something case. I also really dislike Hunter's Prowess. If it was Instant, I could deal with it. It's just setting you up for a 2 for 1 situation. Sorcery Cast Hunter's Prowess onto a creature, creature is removed in response with a Swords to Plowshares. You lose #1 The creature (and the offense) #2 Hunter's Prowess is countered. Plus it's CMC5 is really high, He can enable a double-strike or Infect guy for sure, but too high CMC, and too risky for me. Something like Hunter's Insight I'll take the risk on because I know what Blockers look like, and I cast it JUST before the damage assignment step, so yes, he could still be removed in response, but usually at that point they've accepted/arranged the damage and now I get the draw. Personal preference. If it was an Enchantment as well, I would also be ok with it, as a Sorcery, no thanks. That beings said, if you do connect with it, very nice +3 and Trample and Draw, but why CMC5. I like the Life's Legacy at CMC2. I've added to my Maybeboard, I think it needs to go into my deck as well. Eminence a Cat, Attack with Cat, Sacrifice Cat (As part of the cost, so no way to remove the creature in response to counter the spell), also no targeting. It's pretty good, CMC2 for 4+ card advantage. I like it. Without a creature it's not that great, but hopefully, have a Token cat or something to use. Excellent budget card. Not the biggest fan of Myriad Landscape. i could live with it if it didn't enter the battlefield tapped. Because it enters tapped, it's going to hinder me more times that it's ramp will help me. Oreskos Explorer is good, but I don't like that he is and only pulls more , and is conditional on ETB without Flash. I think he can, in multi-player pods, potentially pull you some Plains, but later in the game unless you're playing other ramp, you'll have more lands that everyone. Everyone else just using Mana Crypt and the sort to ramp without . I don't like that he doesn't mana fix and is useless late game. I wouldn't run him. Rishkar's Expertise is also too high CMC and too conditional for my liking. To properly utilize it, I need 1) CMC6, 2) A decent size creature with Eminence 3) That creature in 2 isn't removed in response (I know it doesn't target, but if i have a 6/6 (eminence) and a 1/1 lifelink token, if they remove the 6/6 in response, I only draw 1 even though the spell isn't countered) 4) I have or draw into a card that is CMC5 that makes sense to cast right now. If any of these things aren't there, it's a dead draw to me. Stalking Leonin is ok, he's 3/3 for CMC3. The selection process feels bizarre/strange/uncomfortable to me. His ability is an activated ability "reveal the player", so if he dies, then all you've gotten is a 3/3 for CMC3. He can only exile a creature that "attacking you", so he can't protect planeswalkers, and he can only remove attacking creatures. The creatures you really want to exile RARELY attack. I would rather have a different creature that provide immediate ETB or Static ability that is not conditional. But that's just me, not a fan of him, which I originally thought I would be when I saw him in the Spoilers. I love Terminus one of my favorite cards. In Selesnya () there's no efficient way to put it back ontop of the deck, so it's Miracle is going to be a little hit and miss randomness, but it's still good. Gets around hexproof, shroud, indestructible, etc. Did you get a Vivien Reid in your pre-release play? 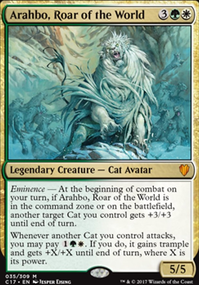 He doesn't really synergize with Arahbo, Roar of the World.1) His CMC5 is quite high for a planeswalker 2) It's not a creature heavy/win-con based deck, so he's not going to consistently draw a card for his +1, unless you put some Scry mechanics in the deck (please don't) 3) Unless you need more destroy Artifact/Enchantment/Flying in your pod, CMC5 is way to much for that. 4) even if you destroy for CMC5, then +1 (no draw), then Destroy again, it's so much CMC and so many turns, too kludgy. 5) Not being a creature win-con heavy deck, the ultimate doesn't direclty represent a win-con for you, it's good, but not a win-con level ultimate. I would make better arguments for CMC6 Ajani Unyielding or CMC4 Elspeth, Knight-Errant or CMC4 Ajani, Adversary of Tyrants. Some others have argued to me that Felidar Cub is a good tempo guy, who "locks down" opponents from casting powerful enchantments until they can deal with him, in that analysis he is good because he's preventing casts. I tried him, I haven't seen enough, I prefer guys like Leonin Relic-Warder that offer solutions without having to die, but thought I would mention him anyway. Revoke Existence is not bad, with it was Instant speed. I'm not sure you want to be the one controlling Artifact/Enchantment. CMC2 for Exile and Modularity is good though, can't argue to take it out, just not sure what Artifact/Enchantment you're worried about that will change/disrupt your plans? The deck looks pretty solid, I'd be surprised if you weren't Turn 3/4 Infect killing with a Lost Leonin + Eminence + Ajani, Caller of the Pride/Berserk/Silverblade Paladin/etc. at least once in a while?? or pulling a Triumph of the Hordes and Trample/Infect killing. Always tutor Lost Leonin if they don't have an immediate response he is a win-con with Eminence. I've killed with him without doublestrike quite often, just having 2 connected hits. Cast a blocker, I'll gladly Swords to Plowshares + Eminence hit you a couple turns. I just did some very quick (5 games) testing, Turn 7 was the worst for lethal damage, Turn 4 the best. It's not bad for a under $200 commander. Takes time to learn how to play it, tutor. Like Congregation at Dawn is Lost Leonin/Silverblade Paladin so you can infect + eminence + doublestrike in 2 turns (as an example). Just some of my opinions anyway! Very nice build, +1. Cheers.